It’s more than just a play of light. Wander down the ramps of the new Pacific Seas Aquarium, and you’ll pass through shimmers of colored light. You’re immersed in their play and flicker, as if swimming through a sunlit lagoon. It’s art – the light installation “Shimmer,” by California artist Gordon Huether – but the story behind the shimmer is just as cool. After coming up with the concept, Huether sent a videographer to the old North Pacific Aquarium just before it closed to film the shimmer of light on the water. The videographer tried a few different spots to get the best shimmer. The raw footage was edited to bring out just the play of light. Refuge VFX, a Portland company that specializes in video effects, installed several projectors along the ceiling of the aquarium ramps. Mapping out the projection of “Shimmer” as it’s installed. Feeding the footage through his laptop, Fred Ruff of Refuge VFX spent several hours calibrating the projection onto the shape of the walls, floor and railing of the ramps. 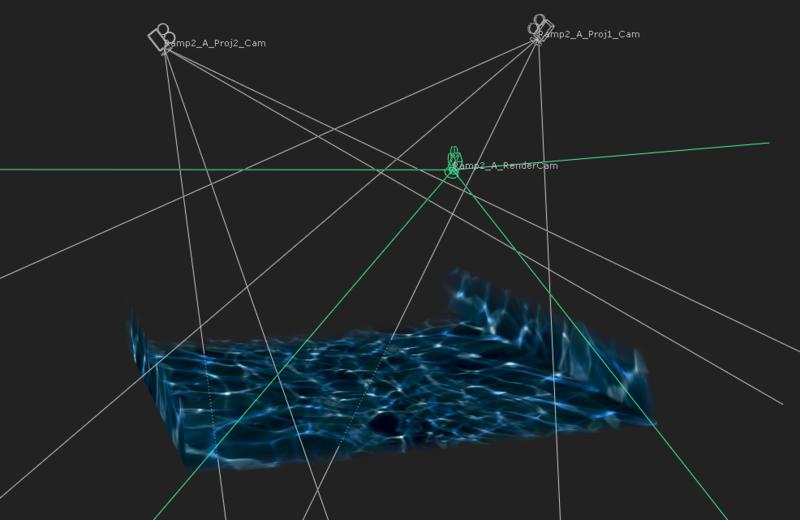 Using the projectors as virtual cameras to measure the space, Ruff used projection mapping software to play with the shimmer in 3D on the screen in order to have it look right in real life. The final shimmer now loops across the ramp, cycling through red-gold, green-blue and magenta-purple. The effect is so realistic that little kids love to play in it, scooping up the shimmer with their hands. “I wanted to remind viewers of the sensation of floating on water, creating an immersive experience for everyone in the aquarium,” said Huether. Gordon Huether’s “Shoal,” with Zoo foliage visible through the window. Even further down the ramps is “Shoal,” another installation by Huether. 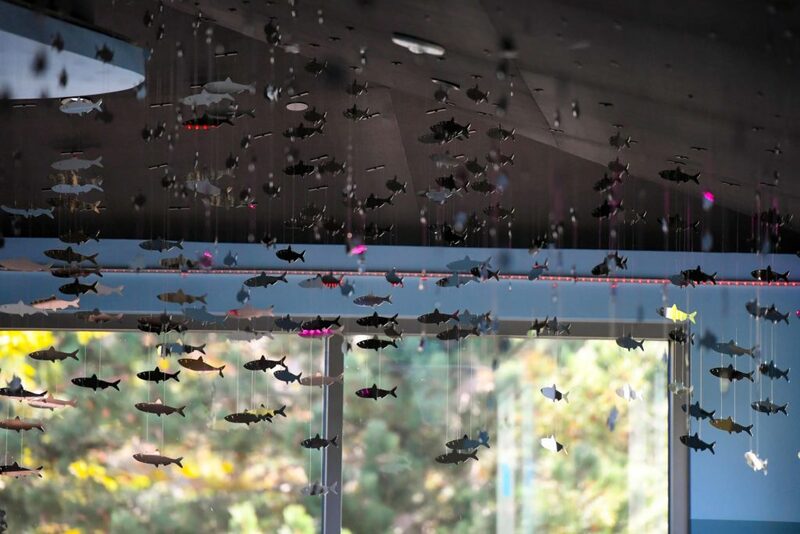 Silvery strands of laser-cut metal fish float and wiggle, suspended from the ceiling and “swimming” past the sculpted barnacle pilings like real schooling fish. As you walk underneath, the mirrored finish of their stainless steel reflects and bounces colored light overhead – you’re now underneath the shimmer and into an underwater world.